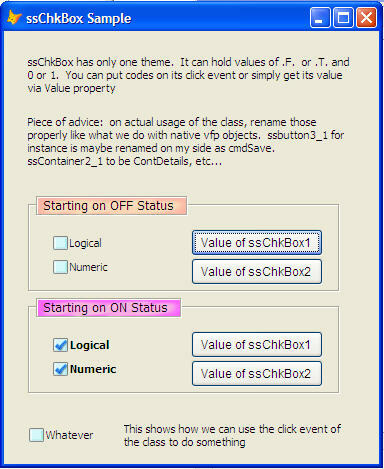 I actually created an ssChkBox before as shown in my TreeView To Do module but I easily got tired of its appearance that it actually was not included in the releases of my classes. Finally though, I think this appearance is really "catchy" that I decided to recreate said class, meaning from my old "dirty" approaches into a cleaner and leaner new class. This actually works just like ssSwitch but there are those who are comfortable in having a checkbox instead of switchbox being it is very familiar to developers and end users alike. This class caters to that "familiarization" aspect. Like ssSwitchBox, this can have a logical value of .F. or .T. ; or a numeric value of 0 or 1 (patterned after checkbox class). Unlike ssSwitchBox though, this only have 1 theme so the parameter that needs to be passed is only two, i.e., its caption and its value. When it is on the checked status, the caption is bold. In addition, like an ordinary native VFP Objects, you can use its click event to do something. Another new spice to make your forms looks "deliciously tasty". Enjoy!